Jeb Bush, who, at one time, was considered one of the clear favorites to win the 2016 Republican Presidential nomination, is expected to launch his campaign to become President of the United States on Monday. The former Florida Governor is expected to make the announcement at Miami Dade College's Kendall campus on Monday. A number of other Republican candidates, including Marco Rubio, have been taking shots at Jeb Bush in recent weeks. Now that Bush is set to formally commence his own campaign, I would expect the former Florida Governor to become more aggressive in fighting back. 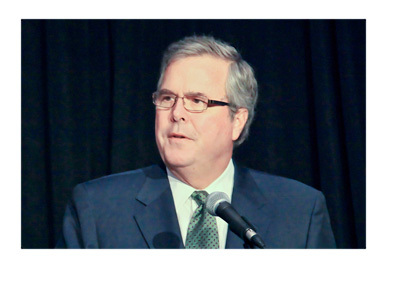 There is a feeling amongst some in the Republican party that Jeb Bush isn't "conservative enough". This is largely due to his support of immigration reform and the Common Core educational standards. Bush and his supporters, however, point to his record as Governor of Florida as evidence of his Republican principles. Small government policies and reform of social services and education in the state, supporters say, led to a marked turnaround in the state's fortunes during Jeb's time as Governor. In addition, supporters say, Jeb has the type of compassion that is missing from some of the other Republican candidates. Another barrier that Bush will have to navigate around - his obvious ties to brother George W. Bush. George W. Bush was a deeply unpopular President and Jeb will have to tiptoe around that "elephant in the room" as he attempts to win over the American public. As mentioned, Jeb Bush was one of the clear favorites to win the Republican nomination early on but has since come back to the pack. The self-described "introvert" will rely on "grunt work" to attempt to win over his party. As mentioned, many in the party feel that Bush isn't conservative enough, while others feel that he is far enough to the center to be able to give Hillary Clinton a legitimate run in 2016. Choose a candidate who is too far to the right, some Republicans warn, and you risk getting shut down by Clinton next year.